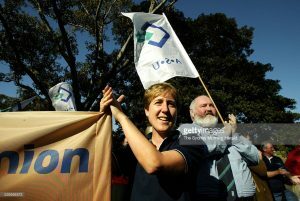 The new head of the Australian Union Movement, Sally McManus, came under a fair bit of flak last week after she declared on her first day in the job that she didn’t have a problem breaking bad laws. The thing is – her comments are exactly the sort of leadership that Australia needs right now. And they reflect an understanding of how democracies negotiate social change. The reflex action of politicians from both sides of politics to condemn her comments, showed that they were willing to wilfully ignore the key role that civil disobedience has in social change. They did this in order to avoid having to mount an uncomfortable argument – that sometimes breaking a bad law is the only way to change it. The truth is everyone, even staunch, law-abiding conservatives are the beneficiaries of past law breaking, and MacManus could have provided the perfect opportunity for our leaders to give a Civics 101 lesson on how unjust laws get changed. Instead we got a twitter attack dismissing MacManus’s quip, in order to get it out of the news cycle as quickly as possible. McManus made her comments specifically about industrial relations laws, and fair enough. It is not widely understood how onerous the laws are on Australian building workers. Building laws currently ban industrial action on safety issues. Yes, that’s right. There are laws that make it illegal for workers to walk off a job when someone has been killed. So when the union walks people off the job to protect their safety and the safety of other workers, they are breaking the law. A bad law. But what McManus said about breaking bad laws applies far beyond workplace laws. Over our history, breaking bad laws is how most good laws got made. Our great, great grandmothers protested and engaged in hunger strikes, often finding themselves foul of the law to win women the vote. In the 1960s and 70s baby boomer radicals evaded conscription, feeding the Vietnam Moratorium movement that lead to Australian troops withdrawing from an unjust war. Similarly, indigenous and non-indigenous radicals undertook freedom rides to remote NSW, desegregating pools that banned Aboriginal kids from swimming, breaking the law in the process. Similar tactics were used to fight another unjust law – apartheid – where radicals threw their bodies into harms way to protest the Springbok Rugby Tour, bringing on a sporting boycott than was part of bringing down apartheid in South Africa. 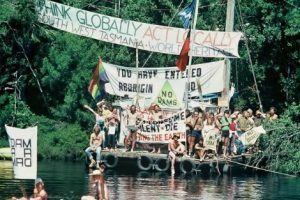 In the 1980s environmental law breakers occupied the giant trees of Tasmania to prevent the construction of the Franklin Dam. And today the Lock the Gate farmers and environmentalists campaigning against coal seam gas are threatened with huge fines and jail terms just for staging political protests. When Sally McManus says she is with the lawbreakers – these are the people with whom she is standing: generation upon generation of heroes who have skilfully used civil disobedience to agitate for a better world. And we haven’t run out of bad laws to break. Whether its bad refugee policy, bad planning policy (like WestConnex), inept climate change policy, the failure to adequately recognise land rights or bad industrial relations policy – there is much to be done in pursuit of a better world. There is substantial evidence from industrial relations scholars that suggests that how a leader comes to power frequently defines their tenure of leadership. Let us only hope that McManus is emboldened by her first day on the job to keep encouraging us all to be more radical in our pursuit of justice. Our world needs it right now.